We were thrilled to watch three of Cooper’s brothers — Tiki, Gunner, and Ziggy Stardust — do their stuff at the WC/WCX (working certificate/working certificate excellent). 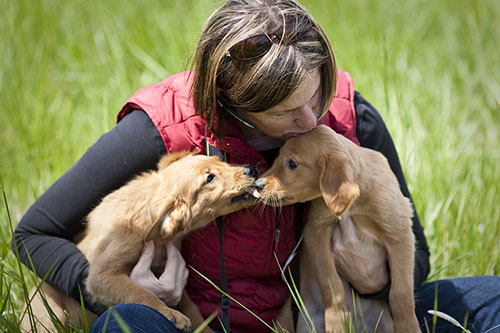 These are breed-specific tests of retrieving abilities. For the WC, the dog has to do a double land retrieve and two single water retrieves. For the WCX, it’s a triple land retrieve and a water double, with an honor added to the mix. 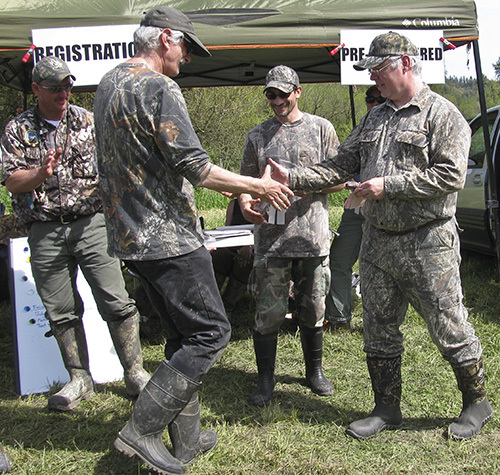 For this WCX, the honor was paired with the land retrieves. Tiki came up from Georgia, Gunner down from Ontario, Canada, and Ziggy Stardust from Massachusetts. All three of them passed the WC. Watching these three at work was a real pleasure and inspiration. All three of them showed a lot of dash and style, and an eagerness to fetch and deliver the ducks. We were sorry that Cooper couldn’t join us in Maryland — he’d most likely have passed the WC, too, and loved every minute of it, just like his brothers. We’ll just have to wait until October when a WC test is available to us in Washington State. 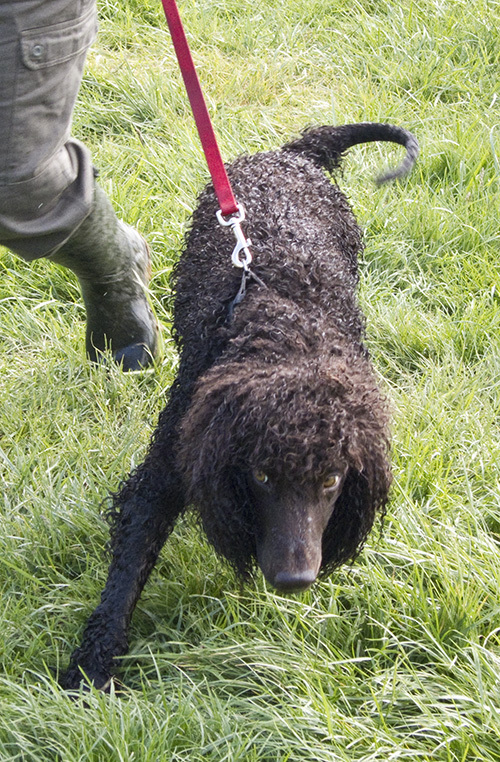 We met Colleen and Jack at Lilypons just outside of Frederick, Maryland, where the Irish Water Spaniel WC/WCX tests were being held. One of the best parts of the day was being reunited with Tooey, who had been traveling with Colleen. We haven’t seen each other for 11 days — practically an eternity. I was dressed for the mud and the cool, windy weather. Tooey was dressed in her usual good-looking fur coat, even if unbrushed. 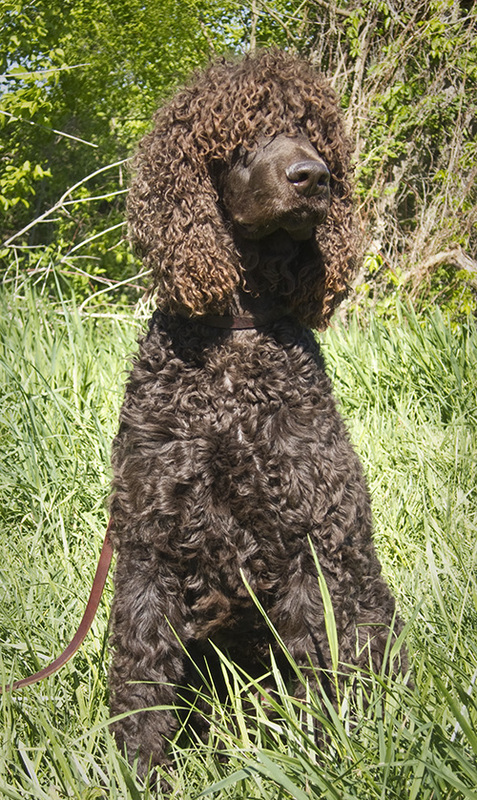 Tooey is on her way to the Irish Water Spaniel National Specialty in Maryland, escorted by Colleen and Renae. Of course, they’re not walking to Maryland. This picture was taken at a stop-over on the way, where I hear Tooey is playing with the other dogs in the host household. Such a nice large, grassy yard. With a pool! What heaven! 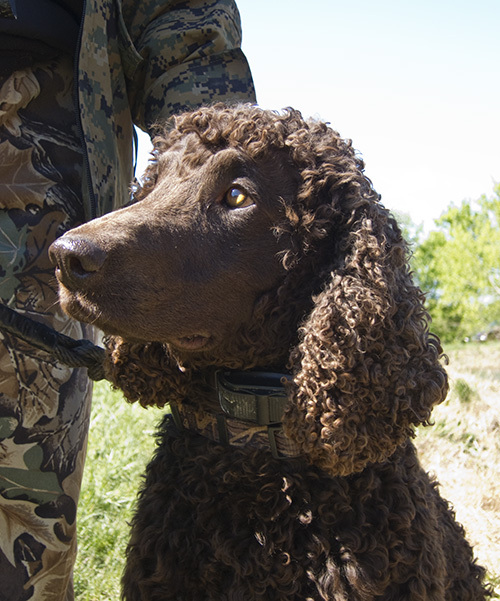 The other curly coated water dogs . . . 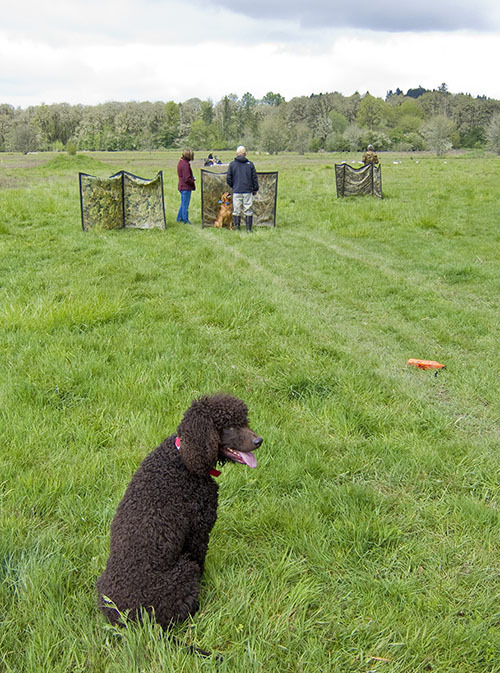 The hunt test practice this weekend in Scio, Oregon was delightful. Originally, I was disappointed that the hunt test was canceled, but then Tellus Calhoun, a pro-trainer and breeder, sponsored a two-day practice in its place. In my opinion, this exceeded the value of the hunt test with lots of opportunities to train in a new environment with lots of distracting stimulus. One of the big delights was to meet lots of new folks, all friendly and helpful. And . . . black Labs were in the minority. There were lots of intense, highly focused Golden Retrievers, one Irish Water Spaniel (Cooper), and three Standard Poodles. 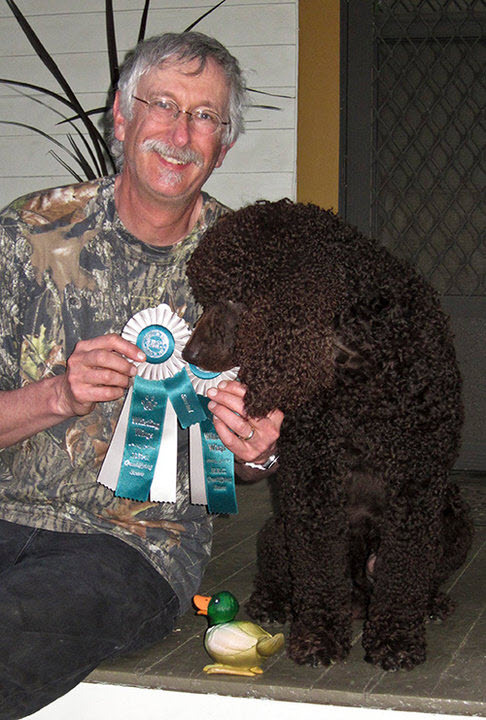 All the Poodles were operating at the AKC Senior level for hunt tests, but they were doing it a with a style unlike all the other dogs. They did all their swims and retrieves with an elegance not matched even by Cooper. Notice in the photos that all the top-knots in these dogs are bone dry. And this is after multiple water entries and swims. And for not-so-squeamish, it should be noted that we were using live flying ducks that met their demise in midair with a collision with a shotgun blast. Mostly. 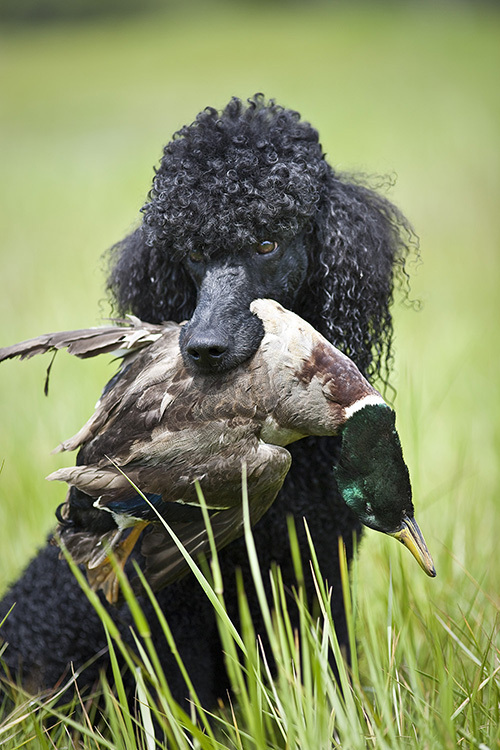 Occasionally a duck would still be clinging to life when it was scooped into the jaws of the mighty Standard Poodle. 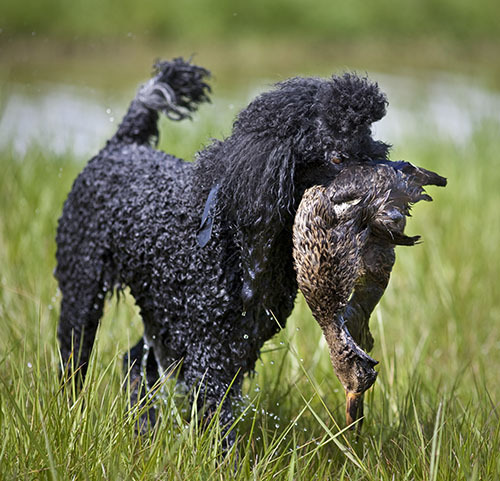 With the duck’s wings flapping and quacks of protest, the Poodles had no hesitation returning the expiring waterfowl to the hands of the (sometimes shocked) handler, just as any Lab would. But with not a hair out of place. … is very… something. 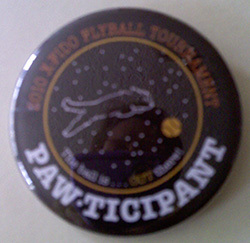 I tried all morning, while working on The Ball is Out There flyball tournament, to figure out what I was feeling. I’d known for quite awhile that Cooper wasn’t going to be with me. 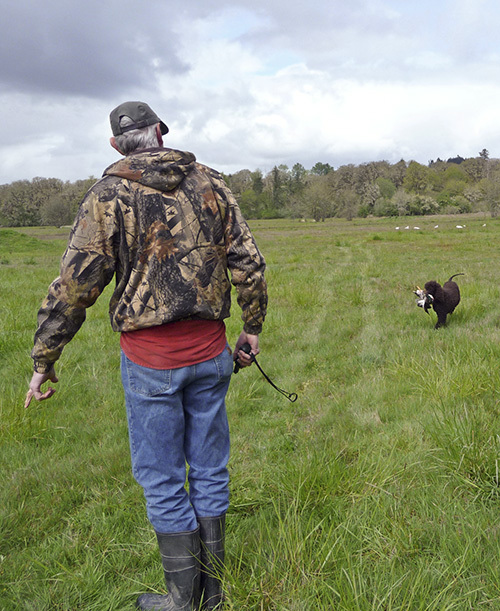 Russ and I had decided to put our time and effort with Cooper into hunt training and testing. And with hunt test season starting up in earnest, there would be no time for Cooper to practice flyball or go the tournament. But I’m a team player, so I volunteered to go out yesterday with the my X-Fidos teammates to help out at the Canby fairground. My official job was “sticker runner” (essentially posting the times and wins on a board after each race), but I did a bunch of other things, too. I learned how to line judge, and did both line judging and box judging. Basically, these positions help the official judge know when a dog has dropped a ball, skipped a hurdle, crossed the line too early, etc. I also had a chance to observe the people at the scoring table enter the stats on the official sheets that are turned into NAFA. And I was a go-fer, getting coffee for people who couldn’t leave their seats, lending my jacket, helping to organize the next day’s prizes, finding a judge’s lost stopwatch, etc. A full day, even without Cooper. But all day, I felt this heavy weight under my ribs. I wanted Cooper with me, and I wanted to be running him. Of course, getting to run a dog is never a sure thing. 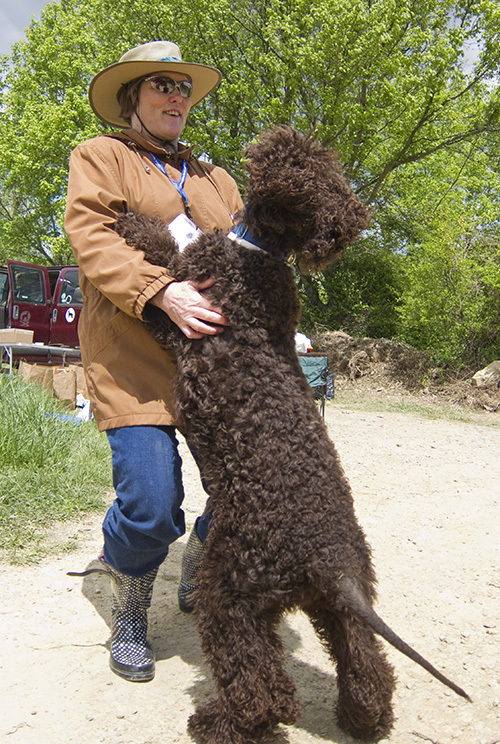 In the last tournament, he was a butthead, being kind of snarky at the other dogs. Not good, and enough to keep him out of the races. And I can’t forget that his toenails keep breaking and he’s got this thing going on with his spine. Maybe he won’t ever run flyball again — I guess that’s the fear and sadness I was feeling. Maybe his behavior got him out of the game, and his health won’t let him try again. I hope that’s not the case. 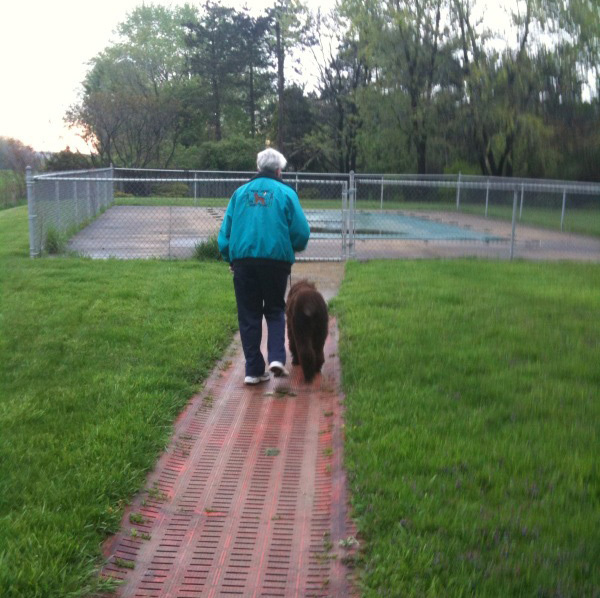 I know he loves flyball, and I do, too. To the untrained eye, the picture below looks like a dog sitting in a field with his tongue hanging out. But to those in the know, this is a photo of Cooper sitting calmly waiting his turn to move up to the holding blind, . . . with no lead. How strange is that? After last weekend’s hunt test with a hyper-excited dog, I spent the past week doing off-leash and slip lead obedience work at home. And it seems to have paid off — I showed up at this weekend’s practice with a different dog. 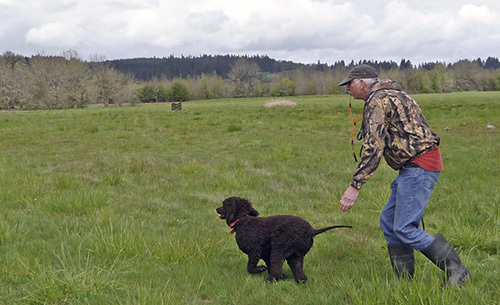 This weekend’s hunt test was canceled in Scio, Oregon, so a local pro-trainer, Tellus Calhoun, put together a training day at the hunt test grounds. Live fliers, shotguns, dogs, decoys, holding blinds, the works. I kept Cooper limited to singles and doubles with some memory blinds. It was good for desensitizing him as well, because this practice was on the grounds of a game farm with several hundred ducks quacking away in a pond nearby. Tracy Calhoun (in the red jacket in the photo above) was nice enough to get some great photos of Cooper and myself working together. Normally, I am the one with the camera, and so I don’t have much access to images of the two of us. In one of the pictures you will notice a flock of white geese decoys that Cooper had to navigate through to find the duck. Second day, 2nd hunt of the Whistling Wings Spring 2010 hunt test. Deeper pond and taller grass than the first hunt yesterday, but the same happy results. Two passes down, two to go for the UKC’s Started Hunting Retriever title.